In Delaware, you don’t have to dig very deep to find delicious, authentic, south-of-the-border, sizzlers. All the flavors, smells, and spicy heat of those empanadas and fajitas might just keep you coming back. So follow our guide to the 10 best Mexican restaurants in Delaware as we get down with our inner fiesta! At El Diablo, you are not going to find Americanized Mexican food items. You are also not going to see so-called “elevated” authentic dishes. But what you will discover are burritos and tacos made entirely from scratch, great food prepared with care and attention to detail, lots of choices of hand-prepared meats, toppings & sauces, and vegetarian options at reasonable prices. Mariachi Restaurant was established in 2006 and features Spanish, Mexican, and Latin American cuisine, and authentic desserts in a cheerful pink building along the waterfront. When is the last time you had an excellent ceviche? Well, here you will find tender white fish marinated with fresh lemon juice, onions, peppers & cilantro, and sopa de lima, a native Yucatan soup made with rich chicken broth, shredded chicken, and lime. Tapatio keeps them coming back with large portions, low prices, and fresh food deliciously prepared. Get simple and delicious tacos, burritos, fajitas, enchiladas, Mexican combo platters, fish, vegetarian & kids menus, and more. Enjoy a classic huevos rancheros, chile rellenos, and chimichangas (soft or fried), or perhaps dip into the special dinner menu, and pull out a carne asada or a pescado frito (a whole, fried tilapia fish with salad, rice, and a tortilla). 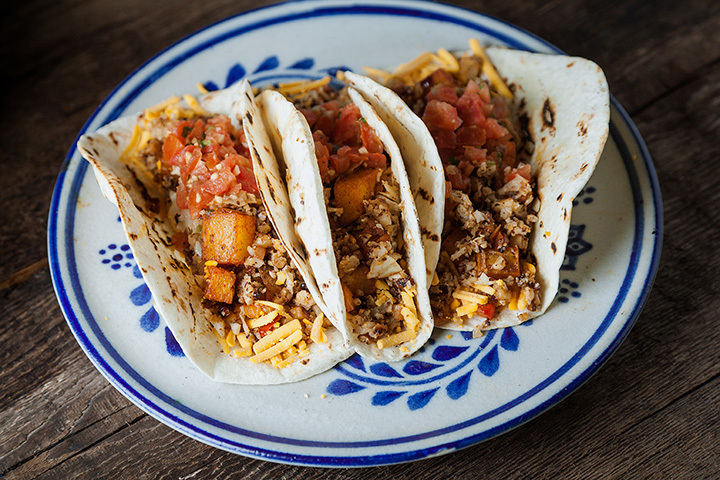 Judging from the outcry of positive reviews, people love Locos, and why not? They are one of the only Mexican restaurants to have a “Fish Night” to combine authentic Mexican cuisine with one of Delaware most cherished natural resources, and their menu feature dish like shrimp & crab burrito, lobster enchiladas, Mahi tacos, and scallop fajitas. Touting an original take on authentic Mexican food, you have to check out the guacamole with shrimp, fresh, hand-made Nachos, steak & bleu cheese quesadilla, tomatillo stack and a shrimp burrito, and the hot tamale with mole sauce. With a focus on fresh ingredients, like slow-roasted chicken, braised pork, and marinated beef brisket, everything from the cheese to the selection of sauces are made in-house. And the care and attention that goes into preparing your meal also go to you freshly prepared drinks from the bar. This casual, authentic Mexican restaurant serves over 200 menu items and is recommended for families, as the selection is so diverse. From $3.99 Wednesday Margaritas to Karaoke Night, there is always something happening. Plus, service is fast and friendly, by all accounts, and the color and smell of the choriqueso, Empanadas as they come to your table will make you feel like you are sitting in old town Mexico City. Shits about to get real! Morelia Mexican Restaurant is proud to serve authentic Mexican cuisine in a friendly and festive atmosphere. People talk about their Compadres with your choice of cheese dip, guacamole dip, beans dip, choriqueso, or pico de gallo, the authentic handmade Fiesta Nachos (crab or shrimp), and the Fried Plantains. Oh, and you’ve never had jalapeno poppers like these, featuring hand-breaded and stuffed ripe jalapenos served with a homemade dipping sauce. Friday Special 10" flour tortilla green tomatillo sauce burrito, any meat chicken , ground beef, chorizo, azada, Pork, burrito served with rice and beans, only $10.00 call us to carry out and we deliver too 302-369-6888@morelianewarkde. Viernes especial 10" tortilla de harina en salsa Verde puede Escoger burrito de, carne de pollo, carne molida, chorizo, azada, cerdo, es servido con arroz y frijoles, sólo $10,00 nos llama para llevar o hacemos delivery 302-369-6888. At Cocina, you will get great happy hour deals, a decent vegetarian selection, and a rolling list of specials, like exotic mushroom tacos. Though the regular menu is no slouch and features offering from the well-traveled Culinary Institute of America graduate, Chef Sikora. Get elevated Mexican dishes, like pork carnitas tacos, ceviche, special meet quesadillas and a creative tapas, and find cantina drinks made the authentic way, with tons of hand-squeezed citrus. A hip and cozy gastropub with over 60 beer choices and crafty margaritas, Del Pez combines all the warmth and good cheer of a traditional pub with the diverse and spicy flavors of Latin America palette. Of course, high food means excellent ingredients, and Pez uses only the freshest meats and veggies to prepare their signature dishes.